My friend, Michael, or possibly his wife Carole, took this picture while they were on their honeymoon. 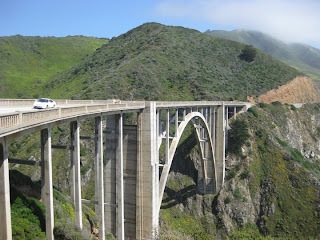 It is the Bixby Canyon Bridge. 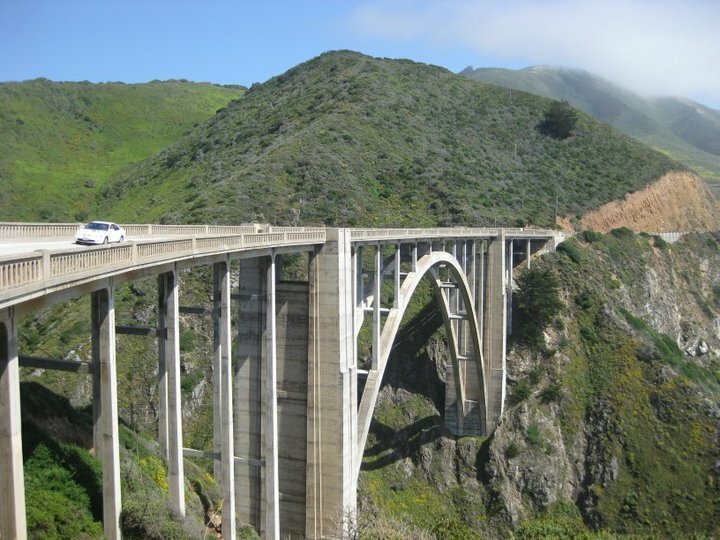 Now, you may wonder why someone would stop, pull over their car, and take pictures of a bridge on their honeymoon. The short answer is that Michael is an engineer. Technically bridges are the domain of civil engineers, but I think all engineers appreciate the beauty and sheer awesomeness of these engineering marvels. That's right, I just called a bridge an engineering marvel. Sure, bridges are common place, even mundane, but there is so much more behind a bridge than crossing vast areas of emptiness. Before the seventh grade, I was pretty much determined to be a straight up scientist. In fact, I wanted to be an astrophysicist. Then, my seventh grade science teacher taught an entire six weeks about bridges. Beam bridges, cantilever bridges, suspension bridges, truss bridges, we learned it all. And it was the most fascinating six weeks I had ever experienced in school. My family moved shortly thereafter, driving from Ocean Springs, MS to Atlanta, GA. Every time we crossed a bridge I explained to my family (who were trapped in the car and could not escape) what made this particular bridge special and why it was holding our weight. How awesome are bridges, I thought, that they can stand for centuries and still hold the weight of tons of cars! So how did this love of bridges convince me to become an engineer? Well, scientists don't dirty themselves with such low things. They don't bother with something as mundane as bridges. They worry about the theoretical and abstract. And yes, there are theoretical engineers and practical scientists, but that is when I discovered I wanted to be practical. I wanted to create things in the here and now that people could enjoy and use. I wanted to better society now, not several years from now after someone else applies the theoretical science I discovered. That was the year I knew I would be an engineer. At the time I did not know about differences like civil engineering versus aerospace engineering. I just knew I had to be out there, building, creating, and adding to the betterment of mankind. Because that is what being an engineer is about. It's about creating technology that helps and furthers people. At eleven years old, I knew. Engineering was and is my calling. Because don't mistake me, my readers, being an engineer is a calling. To be an engineer requires passion, equal to the passion a writer has for words. Why else would a person suffer through five years of the sheer torture that is an undergraduate engineering degree? It certainly isn't for the fun. It's for the love. Remember that next time you need to create an engineer in your writing. A true engineer needs passion, she needs to love what she does. And my engineer friends, remember that day you knew, that moment you first realized you had to be an engineer. When school gets hard or your boss changes the requirements of the design once again, remember you choose this way of life because you love it. When you get laid off because of laws enacted on Capitol Hill, remember that being an engineer is who you are. Do not be discouraged. I know the economic times are hard and that our space program is in disarray. But just remember that moment, remember that dream, remember that child who wanted to reach for the stars and better humanity. Remember being an engineer is not just a job, it's a lifestyle. It is part of who you are.